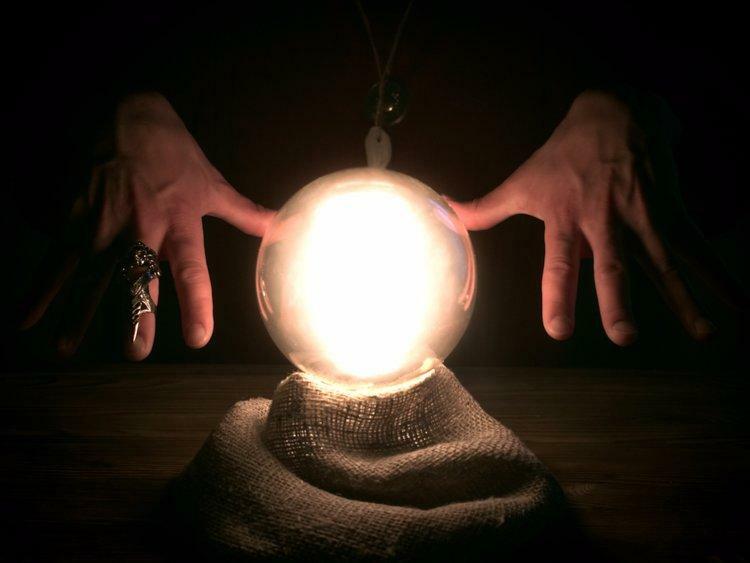 If you have been following my weekly Insight Articles and YouTube vlogs, you’ll notice that from time-to-time, I joke about not having a crystal ball to predict to the future. If you haven’t been following along, you’re missing out, but it’s never too late to get started. Here’s a link to subscribe to my YouTube Channel and a link to all of the weekly Insight Articles that you may have missed. Completing the Puzzle – While I don’t have a crystal ball to actually predict the future for you, I am, however, capable of putting all of the puzzle pieces together to get a sense of what is going on and what is likely going to happen. My predictions are formulated from constantly being around and taking in so many stats, behaviours of clients, trends in the market, and some anecdotal evidence. It’s All in the Stats! Take a look at the graph that I mapped out from the latest 2018 stats below. I’m sure you may have seen something like this before. Many people put the same stats into a similar graph, presenting it one way or another. In my opinion though, there really is nothing to see here. 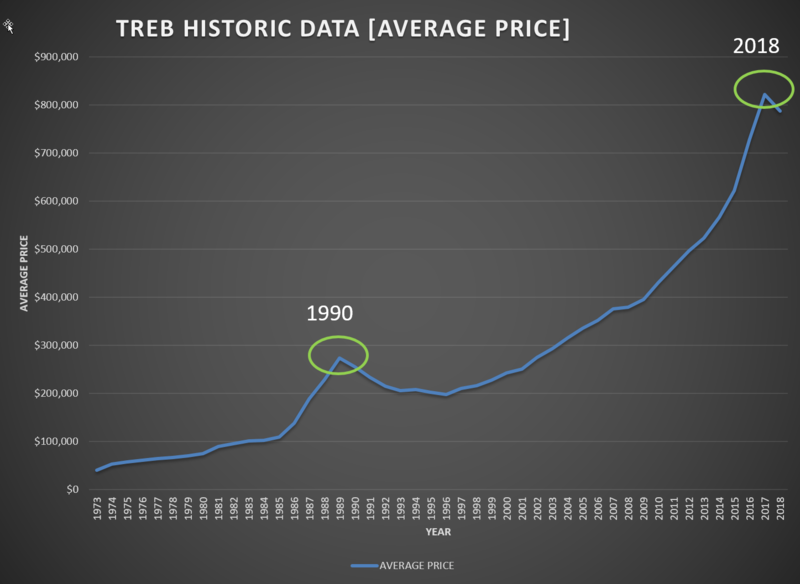 A lot of the real estate bears (a.k.a, the pessimists) will make a big deal about the prices dropping for the first time since 1990, as depicted by the previous graph above. The prices dropped 4.3%, and while that isn’t a small number, it isn’t necessarily considered to be a crash either. 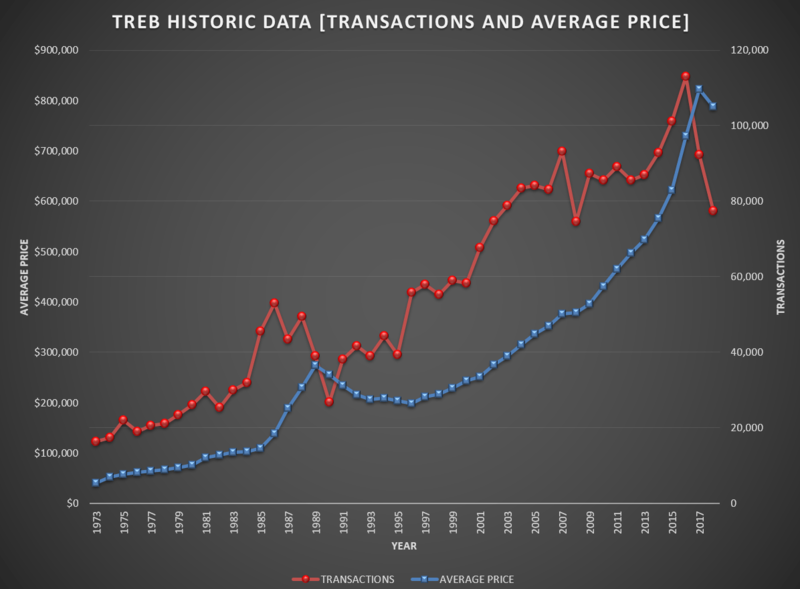 Breaking from the Crowd – What I did do differently was chart the number of transactions against those prices that we saw in the graph above onto the same graph for you, so that we have a better representation of what happened. Reading the Lines, and the People – The number of transactions is seemingly more related to the buyer-psyche than prices. With prices, we’ve seen that if a seller doesn’t get what they want, they will withdraw their listing unless they absolutely have to sell for a specific reason. Anyone who has held onto real estate for over 10 years has almost tripled their money, so unless they need it out of the market immediately, they have no reason to sell it for less. The number of transactions, on the other hand, is dictated more so by the buyers than the sellers, unlike prices. If you take a closer look, the line representing the number of transactions seems to be 1 or 2 years ahead of the price trend line. The former has been a very good indicator of prices in recent years. From the previous graph, you can also see that in the last 2 years, we have seen the biggest drop off in the number of transactions to date. We closed the 2018 year below 80,000 transactions. Evidently, buyer psychology is at its weakest levels since 2008. 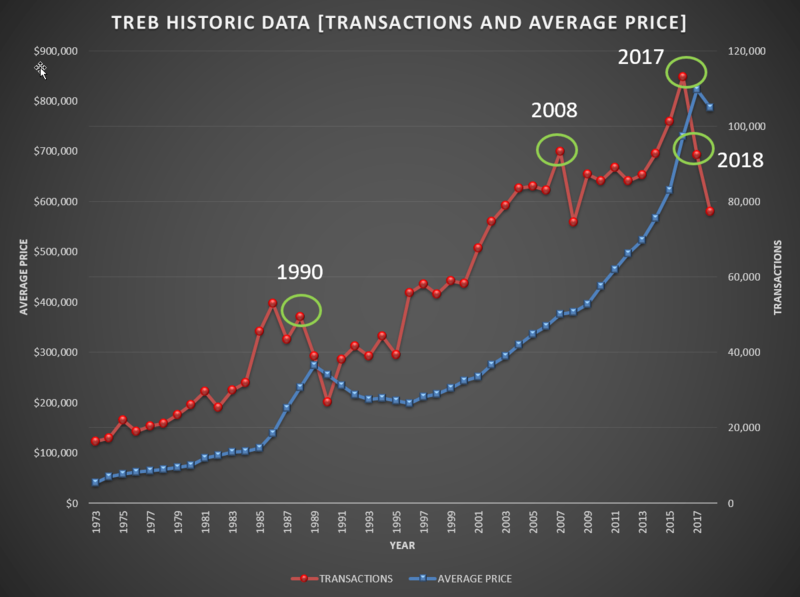 The Lows – The number of transactions that we are seeing is still relatively high, just not as high as we have been accustomed to over the past 10 years. There are some reasons for that though, because every time the number of transactions dipped dramatically, something drastic has happened. Let’s look at each of those points. All of the above events caused some psychological effect on buyers, leading to a drop in the number of transactions for that year. However, shortly after those events, the market bounces back and transactions are back to normal, slowly increasing again. Is this going to happen in 2019? Where Are We Headed? Over the next 10 years, I’m extremely optimistic about where the market is headed. In the short-run though, at the end of 2019, I’m predicting a slight increase in the number of transactions from 2018 (a very small one). This prediction would change though, and will be contingent on whether there are any drastic government-related interventions that occur in 2019. Through the Grapevine – On the government front, there have been some news running through the grapevine as of late, which I have been hearing from multiple sources. We saw the first Bank of Canada interest announcement date come and go with a hold on the interest rate. Even prior to that, multiple sources have told me that there may even be a rate cut this year given the “slightly depressed” Canadian economy. January 9th was one of the few times when the Bank of Canada did not follow the Federal Reserve in raising their interest rates (rather interesting, to say the least). If interest rates stay the same or are cut, that could increase the confidence of the buyer psychology and ultimately increase the number of transactions and prices. Another external change that we could expect is from CMHC. There are rumblings that CHMC is going to change the mortgage qualification process in April 2019. On their docket right now is how self-employed, business owners and commission-based workers will qualify for their mortgages. In the last few years, it has not been pretty for people in those categories. We’ll see what ends up changing. If there is less stringency on how these types of individuals can qualify for a mortgage, then that could increase the number of transactions and prices as well. The Wrap – Considering all of the factors above, plus many conversations with clients over the last two months, I’m predicting a slight uptick in the number of transactions in the GTA as a whole (we’ll probably clear 80,000). In terms of prices, I would say that it’s going to stay relatively the same (perhaps plus-minus 1-2%). If you’re unsure of where to take your real estate strategy from here, do reach out to us and we’ll help you draw up a plan for this year and beyond. Previous Previous post: The Tale of Two Markets – What’s Actually Going On?! Next Next post: What Your Money Gets You!